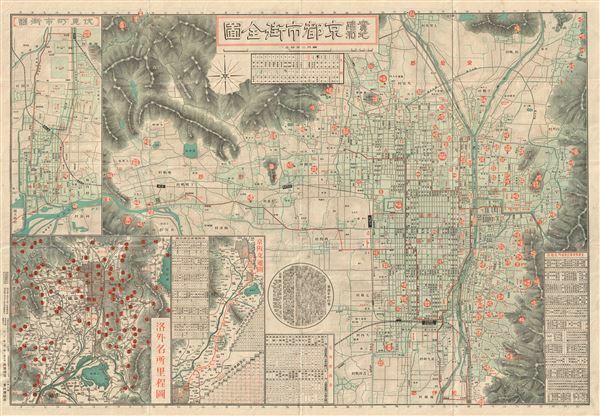 This is a beautiful and scarce example of the 1911 or Meiji 44 map of Kyoto, Japan, published by the Japanese. It covers the former Imperial capital city of Kyoto as well as some of the surrounding hills in great detail showing roads, railways, canals, parks and other topographical details. Kyoto is one of Asia's oldest and most famous metropolitan cities. The map includes insets featuring the Osaka-Kyoto route and distances between major spots in Kyoto are marked. All text is in Japanese. This map was published in Japan during the Meiji Era. Very good. Some wear along original fold lines. Japanese text on verso.